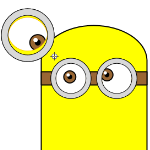 Today I had the idea to make a Minions Visio SmartShape. I was primarily interested in controlling eye movement using ShapeSheet techniques. As a responsible adult, I probably don’t (shouldn’t) have the time to finish it properly. But I thought I’d make this video to show off some capabilities and point out general concepts that might help to make useful SmartShapes. I got as far as making a single eyeball shape, which has a (little, yellow) control handle which controls the direction in which the eye is looking. To make the UI feel better, there is some scaling involved, so that you move the control handle much further than the actual eye movement. This makes it feel like you are positioning the control handle where the eye should be looking. I think it works rather well. There aren’t enough hours in the day to cover all of the details on how the prototype works, but I thought I’d point out some features, introduce correct terminology, and encourage some research and discussion on your part. 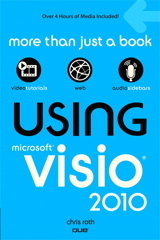 The way to make things like this work in Visio is via the ShapeSheet, which can be a bit of a black art. For the view that venture into ShapeSheet territory, they find it frustrating and fun, and seem to enjoy it in a way similar to the way folks enjoy playing with Lego. The last idea might be for someone creating a web-comic using digital tools that don’t involve drawing by hand. You could create/program a set of SmartShapes that have various options–available via Controls Handles, Shape Data fields and custom right-click context menu actions. Imagine choosing expressions from drop-down lists, setting eye winks, moving eye positions, choosing from a list of mouth configurations. What fun! 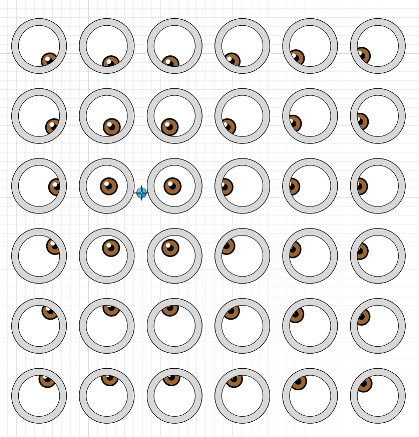 Update: you can glue many eyes to one guide point and create creepy illustrations like the one below. But this same technique would work for, say, a plan view of a whole bunch of swivel-chairs, all aimed at a podium! do you know when you might be finished with the minions? Ok, I’ve put the download link at the end of the article!